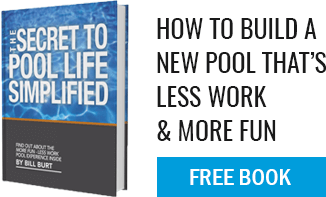 How much work is it to own a pool? Not a lot. And SURLEY not as much as “in the old days”. A lot has changed in the last decade or so, in terms of automation, hydraulics, and options. We are firm believers in the in-floor cleaning systems (never vacuum your pool – YES, that is the truth) which saves a lot of time. Also, pipe sizes have increased, pumps are variable speed and much more energy efficient, filters are significantly larger, and there is easy access to great information (ever heard of the internet?). In the old days, people seemed to be getting “green pools” often, were “dumping shock into the pool all the time”, and “fought to keep the pool clean”. Those days are GONE! If you have to spend more than 15 minutes per week on the pool (not counting vacuuming time – that’s up to you and how clean you want the pool) then something is not right. If a pool is designed properly and has the right sized pipes and equipment, there is not a whole lot of work.